Mohandas Karamchand Gandhi, famously referred to as “Mahatma Gandhi” led India to independence with his non-violent movement. He is called the father of the nation. Here are some amazing facts about Gandhi you all want to know. Mahatma Gandhi was born to Karamchand Gandhi and Putlibai Gandhi on October 2, 1869 in Porbandar, Gujrat, India. Gandhi was a very shy kid in the school who used to often run away because he had difficulty talking with school mates. His nickname in school was Moniya. Gandhi married Kasturba when he was 13. Kasturba was 14 at the time. Gandhi attended law school in London and was famous among the faculty for his bad handwriting. Gandhi spoke English with an Irish accent. Because one of his first teachers was an Irishman. Gandhi lived for 21 years in South Africa. He was imprisoned there many times as well. Rabindranath Tagore was the man who gave Gandhi the tag of “Mahatma”. Netaji conferred the title of ‘The Father of the Nation’ to Gandhi. Mahatma Gandhi’s image has appeared on all denominations of Indian rupees printed since 1996. Gandhi’s birthday is known as Gandhi Jayanti in India and is commemorated with a prayer for peace, ceremonies, and with singing “Raghupathi Raghava Rajaram,” Gandhi’s favorite song. Gandhi was arrested 14 times and spent a total of 6 years in prison. There are more roads in the Netherlands named after Mahatma Gandhi than those in India. Mahatma Gandhi once wrote a letter to Hitler, appealing him to stop the war. 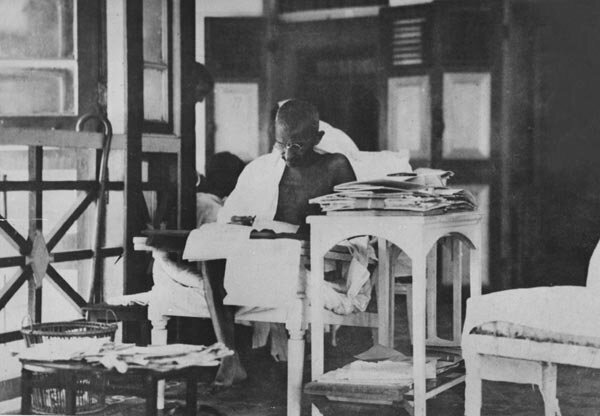 Gandhi referred to him as “dear friend”. Gandhi has influenced almost all leaders of the 20th century. Some include – Martin Luther King, Syu Ki, Nelson Mandela and many more.